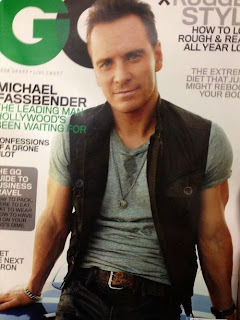 Fassinating Fassbender - A Michael Fassbender Fan Blog: Michael Fassbender on November GQ: Coming Soon to a Newsstand Near You! Michael Fassbender on November GQ: Coming Soon to a Newsstand Near You! Got that right! Michael Fassbender - The Leading Man Hollywood's Been Waiting For! I knew he was going to be on a magazine cover for November in support of his two films, '12 Years a Slave' and 'The Counselor'. Image posted on Twitter last night. What a way to start off the week eh? This will be Michael's third GQ cover. Oh god yes the arms the arms!!!! By the way Simone the background picture looks great!!! so cheerful and relaxed and fun at the same time. Simone, the NAACP is doing a special screening of TYAS in Los Angeles on October 17th. thanks for that information Deseree. It will be interesting to hear about that audience reaction. I wonder if Steve, Chiwetel or Michael will be there. I have only received an invite to the screening with a link to the RSVP page with date and location. No other info is available so I'm not sure if any of the cast will be attending. GQ has posted the cover story at the following link. The video of the cover shoot works; however, the link to the photos for the cover shoot is currently giving an error page. Hopefully, they will fix soon. Thanks Deseree, all pictures have been posted.